Haha, i changed mine at 60k too and there was dirt just falling out of it, but my a/c works great now! Cabin filter at a checker or autozone is $6 - $20 mine was $7.99. the cabin air is located in the glove box, it takes 2 minutes to replace. Yea I wish I would have known about this before. 60K is too long to wait lol. I've been replacing mine every 15k due to pollen allergies and a high amount of dust.. Living in Texas and all. The OEM Filters are not made with activated charcoal, just FYI. so which replacement filter is made with activated charcoal? fram? puralator? filters are 7-12 bucks you can get them from any autoparts store I changed mine out took 10 minutes. just have to pull down the glove box open the door to the filter, pull the old one out, then slide the new one in easiest wat to do this is to just push it's an accordion style filter your not going to hurt it. 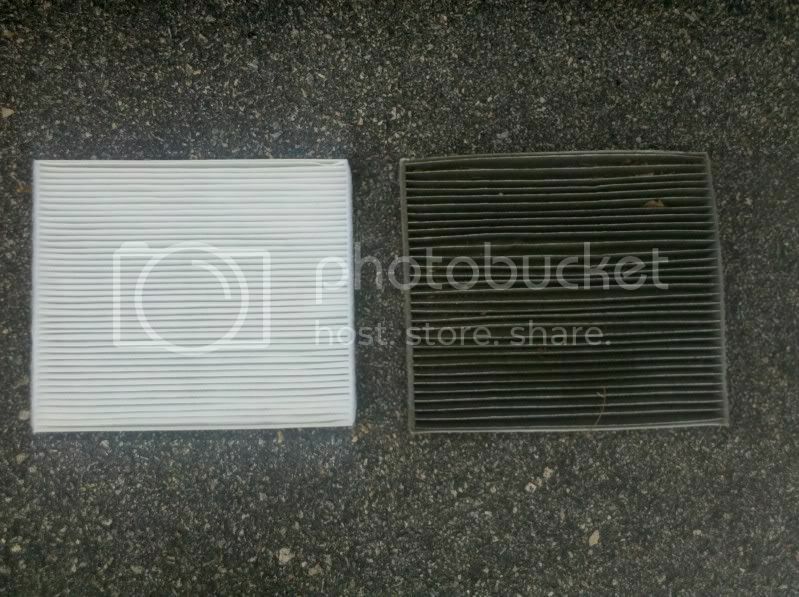 are all the cabin filter same? or is one better than the other? I turn on the AC, I hit the button that makes the air inside the car recirculate rather than letting in new air, and instead of being a steady amber light as usual, it starts blinking and then goes back off. It happened a few times. I later tried it again and it worked fine. I was thinking that it may be a problem with the cabin air filter.... any input? Maybe it was on defrost? That's the only thing I can think of. Wouldn't hurt to pull the filter out and see how it looks. It's real simple. It's like a scavenger hunt when you pull that thing out. Motherfuck... you are probably right black. i did the same thing the next day and nothing happened. yeah, now what happened this morning may be an altogether different kind of thing. Check engine light came on. Got the code p0420. Which may be my cat not functioning properly, large vacumn leak, or godforbid, piston rings. Going to attempt tomorrow. Will get pics. Where are the tabs located as said to drop the glove box? you can clearly see on one side that the filter has been exposed to a treatment process which stains it gray (you can see on the ends where the treatment isn't present). I changed out my original one last week with another GM filter because I noticed an occasional odor coming from my hvac (I'm at 13k miles) - both had that treatment. also, around here the aftermarket filters are $18-25.